You will be able to view a client’s current accounting period in Clients > Company Name > Details > Edit Details. The period is also displayed in the client’s own account, in Settings > Company Details, where you can change it by clicking the Manage button on the right-hand side. Once you define a client’s previous accounting period, you can only edit their end dates. The start date is auto-calculated, read-only. If you need to edit the duration, you can manage this by changing the end date. In order to manage the start date of any period, you must change the end date of the previously completed accounting period. If accounting periods are changed. By taking care of these scenarios we have ensured that the Retained Profit amount correlates to the relevant accounting period. Please note, batch runs can only be completed in chronological order and transaction locking must be turned off in order to complete the year-end process. 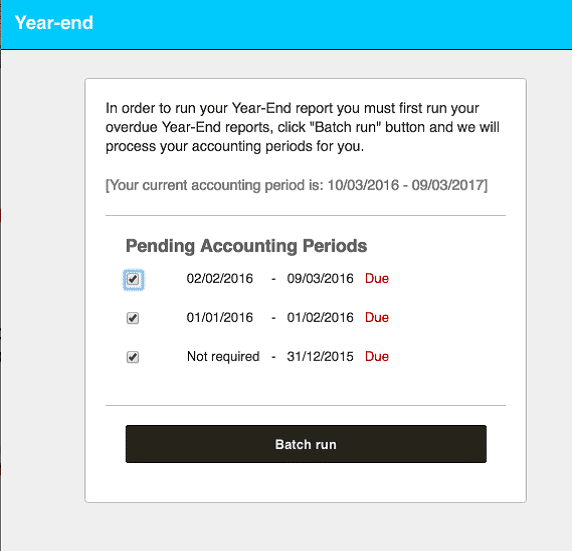 When existing users come to the Year End screen, a notification will inform them that KashFlow will mark this as their previous accounting period. From that point on, subsequent accounting periods will be populated as above.